This video is taken from the GetResponse integration page. Any references to fields beneath this video are in reference to this area. 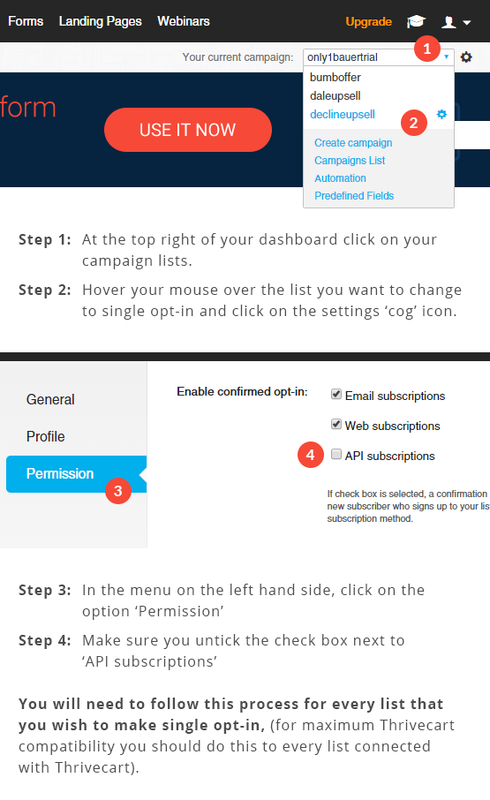 By default With GetResponse they setup your campaigns with double opt-in enabled. This means anyone who tries to join your list, will get an email notification requiring them to confirm before they are actually added to your list. This can cause a loss in subscribers, and prevent your customers from being added automatically by Thrivecart to your lists when they progress through the cart. Luckily there’s a way around this and requires changing a setting on each list. Follow the instructions beneath to switch to single opt-in.